Commemorative Netherlands stamps issued between 1943 and 1945 can be a bit confusing without a little historical perspective. 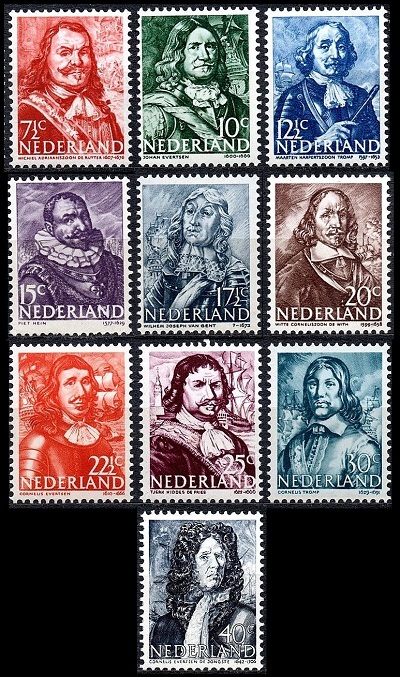 During this period, there were actually TWO entities called the Netherlands, and BOTH of them issued commemorative or propaganda postage stamps. During 1939, at the beginning of World War II, the Netherlands had officially proclaimed their neutrality in the European conflict. The Netherlands was also officially neutral during World War I, though many Dutch citizens joined the Belgian and French armies to fight against Germany during that war. At the end of World War I, the Netherlands had allowed the former German Emperor, Kaiser Wilhelm II, to establish his residence-in-exile there, where he lived until his death in 1941. This political neutrality didn't suit their Fascist German neighbors, who intended to make the Netherlands part of the Greater Third Reich. Germany invaded the Netherlands in May 1940 and established an occupation government there. The country was then ruled by a German-appointed governor and the Dutch National Socialist Party. During the invasion, the Dutch royal family and the heads-of-government escaped to Great Britain, where they formed a government-in-exile. Thus, there were two political entities called the Netherlands, during the period from 1940 to 1944. Though the Netherlands had been occupied by Germany, the Dutch colonies around the World remained loyal, and they fought against the Axis powers with the Allied nations during World War II. The Netherlands was liberated by Allied forces during 1944 and 1945, and after the fall of Germany in May 1945, Queen Wilhelmina and the legitimate government of the Netherlands returned to power. 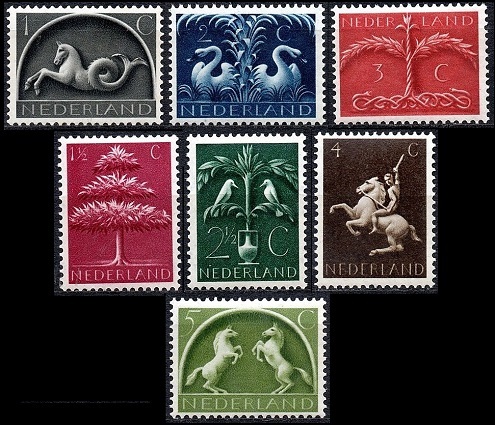 The seven (German occupation) Netherlands stamps shown above (NVPH #405-11, Sc. #245-51) were issued during 1943. The NVPH catalog refers to these stamps as the Germanic Symbols set. 01 1/2 C. - Triple-crown tree. 02 1/2 C. - Tree of Life. 03 C. - Tree with snake roots. 04 C. - Man on horseback. 05 C. - Rearing white horses. These stamps were also extensively used as regular definitive postage stamps. As a result, they are all very common, both in mint condition and in used condition. The ten (German occupation) Netherlands stamps shown above (NVPH #412-21, Sc. #252-61) were issued during 1943 and 1944. The NVPH catalog refers to these stamps as the Naval Heroes set. The designs are as follows. The 7 1/2 C. denomination features Lieutenant-Admiral-General Michiel Adriaenszoon de Ruyter (1607-1676), one of the most revered mariners and naval officers in Dutch history. The 10 C. denomination features Johan Evertsen (1600-1666), a Dutch admiral during the Anglo-Dutch Wars. The 12 1/2 C. denomination features Maarten Tromp (1598-1653), a Dutch admiral during the Eighty Years War and the first Anglo-Dutch War. The 15 C. denomination features Pieter Heyn (1577-1629), an admiral and privateer for the Dutch Republic during the Eighty Years War. The 17 1/2 C. denomination features Baron Willem Joseph van Ghent (1626-1672), a Dutch admiral during the Anglo-Dutch Wars. The 20 C. denomination features Witte de With (1599-1658), a Dutch naval officer of the 17th Century. The 22 1/2 C. denomination features Cornelis Evertsen the Elder (1610-1666), a Dutch naval officer and privateer of the 17th Century. The 25 C. denomination features Tjerk de Vries (1622-1666), a Dutch admiral and naval hero of the 17th Century. The 30 C. denomination features Cornelis Tromp (1629-1691), a Dutch naval officer during the Anglo-Dutch Wars and the son of Admiral Maarten Tromp. The 40 C. denomination features Cornelis Evertsen the Younger (1642-1706), a Dutch admiral of the 17th Century. 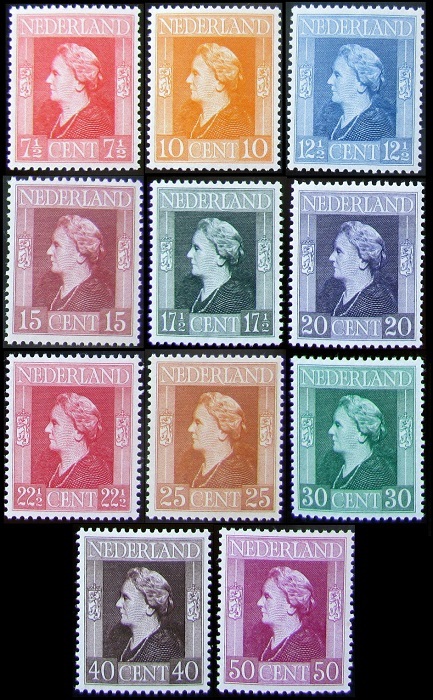 The fifteen (government-in-exile) Netherlands stamps shown above (NVPH #428-42, Sc. #262-76) were printed in Great Britain and issued between 1944 and 1946. The NVPH catalog refers to these stamps as the Liberation Stamps set. 01 1/2 C. - Soldier in an attack. 02 1/2 C. - S.S. Nieuw Amsterdam. 03 C. - Dutch pilot. 05 C. - Royal Naval Cruiser De Ruyter. 07 1/2 C. through 50 C. - Queen Wilhelmina. 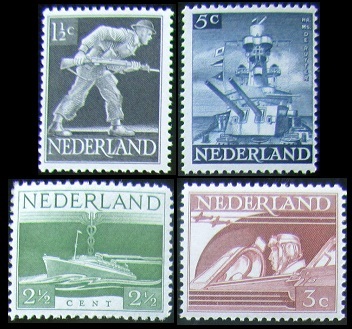 These stamps were issued for use by Dutch naval and merchant vessels during the liberation of the Netherlands. Remember that the lots on most of the European eBay sites are priced in EUROS. Shipping charges may be more, and the lots may take longer to arrive. Also, make sure the foreign seller ships to your country, before bidding on or buying his lot. The overprinted and re-valued (German occupation) Netherlands stamp shown above (NVPH #404, Sc. #244) was issued on January 15, 1943 to celebrate the Founding of the European Union of Posts and Telegraphs at Vienna on October 19, 1942. The 7 1/2 C. denomination Netherlands stamp shown above (NVPH #443, Sc. #277) was issued on July 15, 1945 to celebrate the Defeat of Germany and the Liberation of the Netherlands. The design depicts the Dutch lion slaying a dragon, symbolizing Nazi Germany.